These pancakes are made with coconut flour and they are fluffy – which is a bit harder to achieve when using almond flour (what I usually bake with). There are many virtues to coconut flour, but more importantly, the test for really good pancakes is the fluff factor, and these deliver the fluff. What’s your favorite topping on pancakes? Ours is Grade B maple syrup, although sometimes all I need are some strawberries and I’m good to go. Updated on 4/30/13: I added a pinch or so of salt (about 1/8 teaspoon) to this recipe since these pancakes are a bit on the sweet side. Also, the technique has been simplified. Many of the comments are from an old set of instructions. The recipe makes about 12 silver-dollar size pancakes. In a bowl, whisk the wet ingredients together. Add the dry ingredients to the wet batter, and whisk again until well blended. Let the batter sit for a few minutes so the coconut flour can absorb the moisture. Preheat a skillet on medium heat. Add cooking oil to coat the entire skillet. Whisk the batter again to remove any remaining lumps. Pour about 1 tablespoon of batter for each pancake in the skillet without letting the edges of each pancake touch. Flip the pancakes after a few minutes or when the edges begin to brown and small bubbles begin to appear on the top. Repeat for the remaining batter, adding more cooking oil as necessary. I have been eating coconut flour pancakes everyday for the past month now, they just taste so good with strawberry jam and whipped cream. Hello, I tried this recipe and I think you mean baking powder, not soda. Mine came out very soda-y. I avoid using baking powder because it has starch additives. Feel free to substitute baking powder for baking soda – I haven’t done it yet, but I’m pretty sure it would work just fine. Another option is to reduce the amount of baking soda to 1/4 teaspoon (or none), and then really whip up the batter to add air bubbles to it so it is fluffier without the use of a rising agent (like baking soda or bakign powder). Thanks for the feedback! You can make your own baking powder by using cream of tartar. You mix 2 parts cream of tartar with 1 part baking soda. Then, you can use the measure of the combined mixture that the recipe calls for. I too go starch free, due to AS, and had read about this on other sites. I did this just the other day, and the pancakes came out fine, although I thought that just the soda worked well too. Great to know about this combination! Thanks, Del. Sometimes mine come out thin as well. Yes, try beating the eggs or the entire batter. Also, maybe a pinch more baking soda (or if you use baking powder, I think that might help as well). Do they taste really coconuty? i tried making rolls tonight with almond “flour” (it was pretty course) and they were barely edible. They were very course and mealy and erm… felt like sand in my mouth. They don’t have much coconut flavor at all, oddly. Regarding the rolls, did you use almond meal or blanched, ground almond flour? Big difference, especially for some of the “bread” recipes. See this post for more explanation: https://comfybelly.com/2009/01/the-scoop-on-almond-flour.html. Mmmmm. I am going to try these tomorrow morning! Regarding the baking powder: my daughter is allergic to corn, so I found that Bakewell produces starch free versions of their double acting baking powder and the Bakewell Cream. I special ordered it and use it for all my baking now. I love coconut flour! Thanks, Kelly. Great tip on the Bakewell Baking Powder! Where do you order from online? I got mine from newenglandcupboard.com but I know there are other sites too like yankeeharvest.com that also carry it. I found it by googling starch free baking powder and just went through the first site I found. I think this was the only double acting starch free powder, the others I saw were just single acting which means timing is more important in the recipe. I wonder if a grocery store like Whole Foods would special order it for you… they are adding in a specific allergy section in our local store right now which will include corn free options. Pretty cool. Thanks for listing your sources. I didn’t know about the “double-acting” effect so thanks for that tip as well! I like to try making coconut pancakes but I am allergic to eggs. What should I replace them with? Kathy, good question – I don’t know though. I am aware that there is a powder egg replacement, but I don’t know if it works well. The eggs work as a binder, so maybe some kind of replacement binder? I’ve used 1 T ground flax seed mixed with 3 T water and set aside for a few minutes to thicken which replace one egg, and it’s worked fine. Love the recipes! I’ve been experimenting a bit with this recipe, and the best way to insure fluffy pancakes is to separate the egg whites and beat them until fairly stiff peaks form. Then blend the egg whites back into the batter. There seems to be a dearth of liquid – are the eggs and one teaspoon olive oil really the only liquid? What about some coconut milk? Hi Shannon – I actually have the opposite experience – a bit runny. In any case, you can certainly add some coconut milk to the recipe. But check your other measurements as well – maybe you’re adding too much of something else? I just tried the coconut pancakes, I also ended uo with a dense pancake that did not cook all the way through. And even tho I only used 3 large eggs, it was very “eggy” tasting? Other than adjusting the amount of flour, do you have anyother suggestions? Thanks Kay! I’m quite baffled at the array of results – too thin to too thick. I’m not sure what else to say except to try adjusting ingredients and double-check the measurements. This pancake is a bit more runny and thinner than a regular pancake. Yes, it can be a bit eggy too – it does call for a higher ratio of eggs than a normal batter. Also, try the pancake 2.0 recipe. I tried these pancakes but I found that by adding just 1 teaspoon of lemon juice to the recipe it made them really fluffy. I love coconut flour! It has saved my life. That and xylitol (unable to have any sugars at all). Anyway, the pancakes are to die for. I sent the recipe to my daughter who also suffers from my affliction [no sugars, no starches, no bovine dairy … except butter (thank God) and whipping cream]. Thanks for the wonderful recipes. Life is good. I am new to gluten free cooking, and I didn’t even know about coconut flour! These turned out perfectly! I was so happy I froze a bunch and now my daughter eats them in the morning during the weekdays. Thanks so much for this delicious recipe. hmmm…as written, this recipe yielded pancakes that tasted just a little bit ‘off’ to me, and i think it’s because i’m so used to buttermilk pancakes. i added a little apple cider vinegar (as well as a little milk to thin out the batter), and voila! the slightly sweet/sour tang i’m used to. thanks for a good starting point! Have yet to try coconut flour. What brand and where do you get yours? Vanessa, I get coconut flour from Tropical Traditions: http://www.tropicaltraditions.com/. Since I’m new to the paleo way of life, I’ve been having a tough time wrapping my brain around the flavor changes. This recipe totally helps even though it’s a little dry- my breakfast menu is officially saved! Thanks! Oh and I used the baking powder sub… major fluff! Fantastic as waffles with berries on top! Just calculated the nutritional information: if you use xylitol instead of honey or maple syrup, the whole recipe has only 350 calories in it!!! Hi Wendy! Thanks for the info. How did you calculate it? Just curious. Wendy – good to know these work as waffles! I was just about to try them out since I have a new batch of coconut flour. Hi, I’d like to try this, but I don’t want any sugar or sugar-type sweeteners at this time. Will this recipe work if I omit the rapadura and/or honey/maple syrup? Victoria, I don’t know, but most probably it will. Pancakes don’t usually have much sweetener in them anyway. Let us know if you try it. I don’t get it?! With 3 eggs and 2 tablespoons flour it’s an eggy mixture? I’ve added a good tablespoon of sorghums flour. Hi Jessica. This is not the standard American pancake recipe – it is, as you say, thinner and runnier. But, as you note, you can make it thicker with more flour. I’d love to know how the freezing experiment turns out. Thanks for all the valuable info on your changes! Thanks Dave! My links changed when I ported the posts to the new site. How do you make pancakes with two tablespoons of flour? I don’t know how to get 5-6 pancakes. I got 3 at the most and they weren’t thick or big pancakes. They are about silver-dollar size, if that helps. I made these and they had an “eggy” flavor as one commenter noted, so I made another batch and replaced one of the three eggs with a few splashes of almond milk and they turned out great! Fluffy and light. Thanks for the recipe! Thanks for letting us know! I suspect it may depend on the egg size as well. 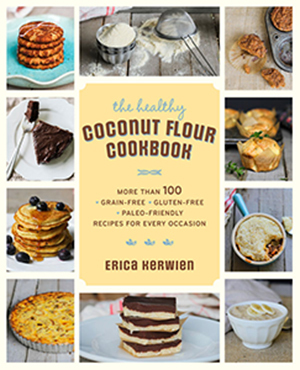 just discovered your blog today when looking for a coconut flour pancake recipe. mine turned out pretty good consistency but i feel it needs more flavor so i will tweak that to my liking. unfortunately, the use of coconut flour, coconut oil and some coconut manna with cashew butter for topping ended up making my guts HURT. i didn’t eat much of the pancake since it was so filling so i’m hoping it was just the coconut manna that pushed me over the edge. i REALLY want to be able to use this recipe because i love pancakes. i have no known food intolerances or allergies (except dairy) but my husband and i do chose to avoid wheat and eat fairly low carb. i am very sensitive to lots of foods and food combinations but have never been tested. the GI doc i once saw just said, if something makes your gut hurt, then just avoid it. sounds simple, except when i still come across something or some combination of foods every few weeks that mess me up! i am so glad to have found your blog. Best recipe ever! I make this almost every other day. I mix in dark chocolate and/or banana and blueberries.Yummy! That’s awesome to hear! best wishes! I really love your recipes, thank you for blogging them for us! When you measure it, pack it in like you would brown sugar. It helps to insure consistent measuring. When you add it to the recipe, sift it in with the other dry ingredients. This helps to smooth out lumps and make the batter less dense. Oh! Forgot to say, the fresher the eggs and quality of (organic, grain free, pasture raised is the best!) the eggs goes along way with flavor. The “egginess” might not necessarily be the recipe itself but the quality of eggs you are using. I just tried this recipe in my donut maker, to have breakfast ready when I wake up in the morning, they turned out pretty well, and delicious, just like your other recipes, but one exploded, I’m thinkin it might be the egg, that’s causing this, but they were still delicious, with a little honey drizzled on top. These are delicious! Just made them for the first time and added some pumpkin puree – so yummy! Thank you! good to know, I’ve been wanting to try that! Hi-I love your banana bread recipe and I thought I’d try these pancakes. Is there really only 2TBS of coconut flour in the recipe? It seems like too much liquid to dry. Please clarify if you can. Thanks. yes, it’s true. They are very light. I tried these with the recipe as shown & they came out fluffy & yummy – my daughter needed a little more flavor so I added some ripe mashed banana & WOW!!! Super yummy !! Thx for this recipe! I kept coming across almond flour recipes which I try to avoid for my daughter she’s on a anti inflammatory diet due to neurological issues , so this recipe is perfect next I’m going to try a batch adding some applesauce .thanks for your yummy recipes! I wish I had found your recipe BEFORE just using coconut flour in a regular pancake recipe! That was a disaster!!! I am looking forward to making this recipe! I was SO excited for this recipe. The batter smelled good enough to eat on its own, and it cooked up flawlessly fluffy. But then when I tried it, all I got was an overwhelming taste of egg. Even drenched in butter and maple syrup, they tasted more like fluffy scrambled eggs than the slight hint of coconut, vanilla, cinnamon, and honey in the batter. You’re the pro so I figured I’d ask before trying this recipe again…have you had success in baking replacing one egg with either 1/4 cup applesauce or 1/2 a mashed banana? I know coconut flour needs a lot of liquid to soak up, but I’m hoping applesauce might do the trick to cut this down to 2 eggs. Are you using US large eggs? If so, maybe try one less egg or add more coconut flour. These are not eggy for me, but to some degree the recipe will be dependent on your egg size, any substitutions you make, and your coconut flour. Either sub will work, but I’m not sure if that’s your issue. I would suggest adding just two eggs and seeing how the batter is at that point. Hope that helps. I’ll try again with just 2. Thank you again for the feedback! ha, so funny. I agree—egg sizes vary regardless of labeling! Just finished eating some of these. Very good! I have tried several grain-free pancake recipes, and this one is, so far, the most fluffy. I think it is partly due to the lack of banana. Made these today and batter really runny. Pancakes have just turned out very flat! Wonder what has happened? I added a banana, left out the honey and it was a total hit here with 4 kids! HI! I’ve just discovered your website and it was love at first sight! Thank you so much for this blog and rich variety of great recipes! 🙂 When it comes to this recipe, I’ve just wondered if I could make it without oil ? What do you think? Ps. I’m really sorry for my English but I hope you understand me. I believe your site will help me to improve my skills! 🙂 Thank you. possibly, I haven’t tried it though. Butter or coconut oil are options, or coconut milk. Hi, my old coconut flour pancake recipe has disappeared and so I found yours. I just want to make sure I’m reading this right, you really only use 2 TBSP coconut flour for the entire recipe? I remember using a lot more. I just thought I’s double check. Thank you! These come out great every time. Thanks for sharing! Yes, this is an older recipe that’s pretty basic. You can try adding some vanilla extract and mashed bananas to make it thicker and richer.